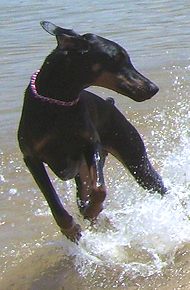 We will place Dobermans anywhere in California and also surrounding states. Out-of-state adoptions are considered on a case-by-case basis. However, we do not ship dogs: you must be willing to come and get your dog-and to return the dog in person if the adoption does not work out. We do not make Dobermans available for adoption until we have had the opportunity to get to know them as individuals. Many of our rescues need weeks, months or even years of rehabilitation before they are adoptable, so we know them well. We ask a minimum donation of $250 to help cover the cost of caring for these rescued dogs. The donation is tax-deductible, and refundable should the adoption not work out. Local adopters receive one free bath at Canine Creek Dog Wash and Boutique and one free professional grooming at Tehachapi Pet Lodge and Outfitters, both in Tehachapi. All of our Dobermans are groomed prior to going to their new home. 1. Click here to read "Note to Adopters." 2. Check our list of available Dobermans. 3. Send us an email: dobiesos@earthlink.net. 4. Schedule a telephone interview and home visit. Our adoption process is designed to insure that the Doberman you take home is a good match for you. There are many things to consider: your experience with Dobermans and dogs in general, your activity level, the amount of time you have to spend with your pet, other animals and family members in your home, and much, much more. When you find a Doberman on our Available list that interests you send us an email with your name, phone number, and the best time to call you for an interview. During the interview you can tell us about your situation, needs, and desires and we will tell you as much as we can about the dog you are interested in. Jointly, we will determine if you and the Doberman sound like a match or we may suggest another dog that seems like a better fit. If we do have a Doberman we both feel is suitable we will arrange a home visit at a time that is convenient for you. The home visit is an opportunity to meet your other family members and pets, if any, and to perform a safety check. If you live outside of our locale we will find someone in your area to perform the home check for us. We do not show our Dobermans until the telephone and home interviews are complete. This way, when you meet your prospective Doberman, should you decide to adopt, you can take the dog home immediately and you don't waste time meeting dogs that are not right for you. You are under no obligation to adopt a Doberman. If you decide to adopt, you must sign a contract that will remain in effect for the duration of the Doberman's life. You will receive copies of all of the Doberman's veterinary and vaccination records and any other information about the dog that we have. You will also receive a Dobie SOS dog tag that is to be kept on the dog henceforth. If a Doberman has more than one interested party, we will try to place the dog in the home that we think is best for that particular dog. We do not wish to disappoint, but our number one priority is as an advocate for the dog. You have a new Doberman! Our interest does not end when you take your new family member home. We are always available to answer questions and to help in any way we can with whatever comes up during your Dobe's lifetime. We can help you with medical and behavioral questions or at least point you in the right direction. You will receive our newsletter and other rescue updates. We in turn would greatly appreciate updates on your Dobie's progress and we ask that you send us a photo at least once a year. Once a Dobie SOS dog, always a Dobie SOS dog. Because we work diligently to match the right Doberman with the right home, we have very few returns. However, if you cannot keep your dog for any reason we will always take the dog back, in fact, the dog MUST BE RETURNED to us. This applies whether you have had the dog for 10 minutes or 10 years. This is part of our contractual agreement. Our goal is a lifetime partnership between you and your Doberman Pinscher! WHY do we put you and ourselves to all this time and trouble? Experience has taught us that people who are willing to go through some trouble to get a dog, will go through some trouble to keep it. PLEASE keep in mind that every bit of our rescue and adoption work is performed by volunteers whose only payment is the satisfaction of seeing a formerly abandoned Doberman in a good home--maybe yours!